pLOT 1.0.10g is out. This update introduces the ability to edit the sequence and feature annotations from the "View/Edit Sequence" item under the "Edit" menu. Aside from editing the sequence itself, you can now change. A right click on a selection gives the option to edit any of the features selected. Moving the cursor with the direction keys or mouse results in the lower status bar displaying which feature(s) you're on. pLOT 1.0.10f patch (If you have previously run the 1.0.9f or 1.0.10e full installation) is now up. A bug in the that sometimes caused the program to crash at startup if the last instance was closed at a certain height has been fixed. 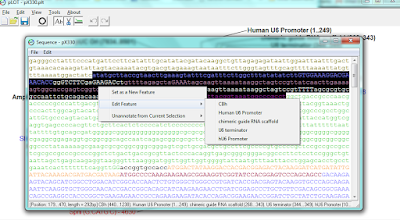 Additionally, the View\Complete Sequence menu now opens the complete sequence in a new window that has the base pairs colored by their features' colors. Moving features forward or backwards in the drawing order affects which color is shown between overlapping features. Moving the cursor in the window or highlighting text causes the status bar at the bottom of the window to tell you which feature you're on/have selected. This is a transition step to having the ability to edit the sequence in this window which has not yet been implemented. See images below. A few bugs that crept in during the addition of the undo/redo code has been fixed. pLOT 1.0.10e patch (If you have previously run the 1.0.9f full installation) and full install (for new installations) are now up. This update now has added an undo and redo button on the main window. Alterations to the sequence, feature annotations, restriction enzyme selection, etc... can be undone or redone. 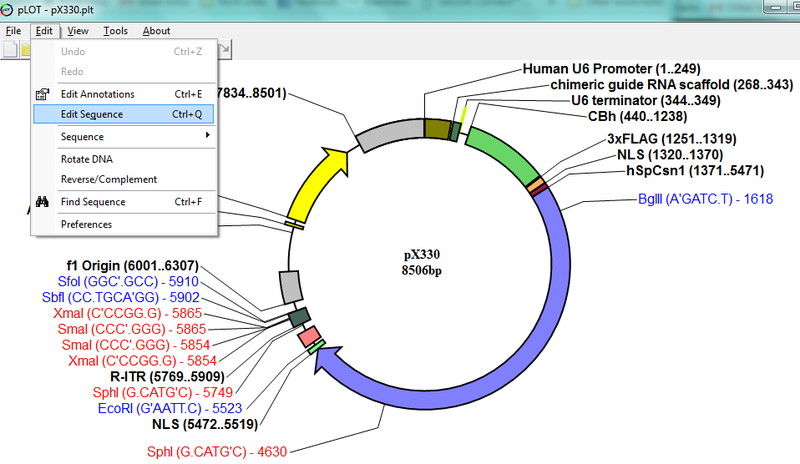 A bug in the restriction enzyme window that made it search for the sites unnecessarily has been fixed.